One of the critical components on a vSAN environment is it’s I/O controller’s and flash drivers and firmwares, VMware provides two sets of guidelines, one for general purpose and one specific for vSAN purpose, and they are NOT mandatorily the same. When you install ESXi, either through the VMware ISO or a vendor’s custom installation ISO, it comes with general purpose driver, which might lead you to issues on your vSAN environment and thus you need to replace them by the vSAN’s certified one. 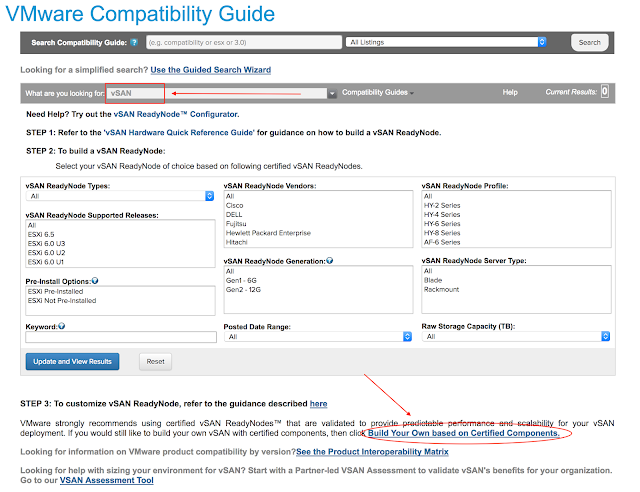 Let me make crystal clear here, if you are building a vSAN environment you MUST use the firmware and drivers certified for vSAN. There are many ways and tools to help you identify correctly what controller, model and driver are right for your environment. First, identify if your card has been found and loaded by the host. As you can seem my controller has been loaded to adapter vmhba5 and it’s using the lsi_mr3 driver. Second, let’s also check which driver’s version this module is using, so we can compare with the HCL later. In the example, it's running version 6.610.17.00. Third, let’s list the device’s details, you can filter by adapter name, I’m just filtering anything with hba on it. Now let’s find exactly what this controller is. Switch the filter to IO Devices, then use the fields on the right to filter out with the details we just grab from the previous step. Once you update the results you will get your controller model. Remember it’s the general purpose information, and the idea is just to identify the controller based on the codes we got directly from the hardware itself. With the controller model we just found previously, just type it into the keyword field. Click on the controller to see it's firmware and drivers requirement. 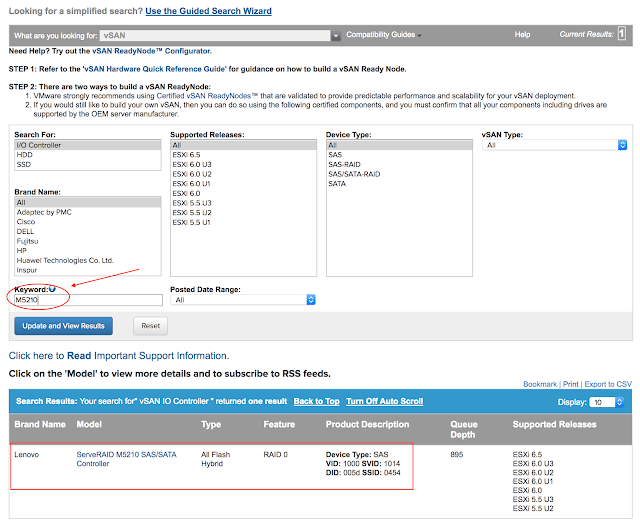 After I change the driver from lsi_mr3 to megaraid the vSAN health check status changed from warning to Passed. 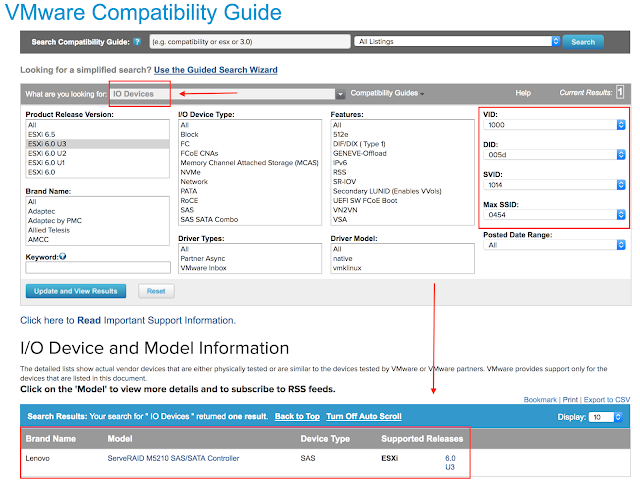 At this point we just check drivers version, firmware version, on the other hand, is hard to find through the host and it depends if the vendor provides such functionality but it's critically important to have them accordingle with vSAN HCL. Please check with your vendor how to obtain this information, most of the time it comes from baseboard utilities. Another thing to keep in mind, is about ESXi lifecycle, when creation your Update Manager make sure to include just the drivers certified to vSAN, otherwise, it might install general purpose drivers and vSAN Health Check will report warnings again. If you want to learn more check VMware vSAN Diagnostics and Troubleshooting reference Guide.